Why I love my life: Apparently you can't take cats for walks!! Apparently you can't take cats for walks!! In what I refer to as my former life, when I lived in Emerald, and I was married to John, (who is now deceased), I owned a cat. A Burmese to be exact! I named her Champers, as she was just a blush colour of champagne! Ivory and Charky so deserve their own story, so I am just moving now into a further moment, in which Ivory and Charky were left behind us. 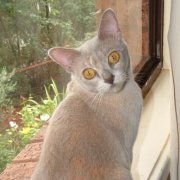 As time went on, we moved to Emerald, Queensland, and one magical day I was introduced to a Burmese kitten, and Hello! She had me at her first roll of her blue eyes and her soft purr. I was instantly in love with a cat - even I couldn't believe it! I brought her home as soon as she able to be mine. At the time I also still had my Australian terrier, Elsa--who deserves to have her own story - so just concentrate on the cat mainly in this one - but Elsa plays a part - probably the cause of why I almost wet myself from laughing so hard in public--but hang on---I'm not there yet in my story! Believe me--it will be worth it! It was a Sunday, and John and I had taken the girls to church, and were just relaxing, when I came up with the absolutely great idea of taking Elsa and Champers for a walk with the family! Now it was mid afternoon in a sleepy town, and we were all still dressed in our Sunday 'best' and we had Elsa on one leash and Champs on another leash. It seemed really quite normal. We walked around the block and stopped and said hello to friends, and just as you see in the movies, it really was all very idyllic. Except, for Champs, who appeared to suffering bowel problems. She would only do the poo deed in her box. And her tummy had been rumbling for about 10 minutes when we thought we had better head home. Anyway, we were about two blocks from home, and John, who by this stage was now carrying Champs to speed up the process to get home, for her bowel release, walked ahead of us. Remember - he really DOES NOT like cats. Elsa and the girls and I sped up our walking pace to help him, when suddenly there was this unusual cat yowl, and unfortunately, Champers pooed all over the front of John's good church shirt! As we were behind them, all we heard was Champs wailing, and John yelling and holding her out from him--we later arrived to the ugly scene. I started laughing then! I know I shouldn't have - it was disgusting! It smelled really awful, and Champs was all beside herself, poor thing--she didn't mean to do it! But the look on John's face- priceless! He smelled so bad!! He just looked at me, and left Champs with me and the girls. I did mention that he doesn't like cats? Well- This clinched it. No--what really clinched it was when, as she was pooing on him and he kept running for home, suddenly the neighbourhood dogs caught up on the scent I guess and there was a whole parade of dogs after him! It was so funny! Anyway, John didn't know what to do--and we arrived shortly afterwards, followed by the neighbourhood dogs. Bron chased them away, and I did what any good wife would do. I grabbed the garden hose and hosed the cat poo off the front of my husband's shirt! In the backyard, amidst the laughter and the pants wetting and the swearing and the smell. By this stage, Champers had settled into her zone and was calm again, and after some time, cleaned herself and got back to normal. Elsa just layed on the back lawn and smiled most of the afternoon. I think she even smiled in her sleep. Hilarious…..wish I had been there to see it….what a hoot. Poor cat! Elsa - Our Red Dog!